eng Shui, the ancient Chinese art of placement dates back to before the Bronze Age, but the techniques and philosophies behind it still work today. Considered an art and science, Feng Shui goes beyond decorating a space to make it look good, it is meant to create harmony in your surroundings and ultimately in your life. 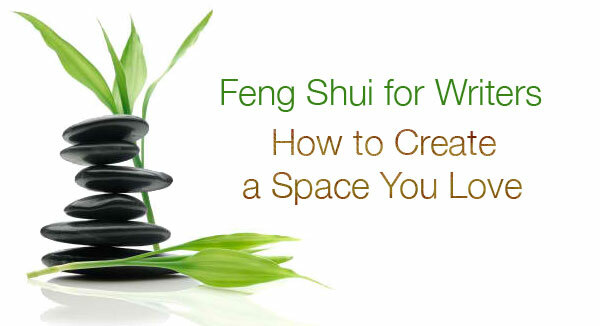 As writers, it is important to have a space that allows the words to flow and Feng Shui can help accomplish that. The good news is that it doesn’t have to cost a lot and can be done with items you already have in your home. This article will share simple ways you can implement Feng Shui into your writing space, making it a place that encourages creativity, inspiration, and success. When looking at your own writing space, one of the first things all the experts believe you should do is get rid of the clutter: all those extra things you have laying around that don’t serve a purpose. By doing this, you open up the Chi—the invisible life force or energy that is in and around our bodies and our environment. We experience Chi through our five senses, what we see, hear, feel, smell, and taste. Too much clutter stops the flow of Chi and can make us feel stuck and stressed. Once you declutter, you can begin creating a writing space that works for you. If you are a piler, give yourself lots of horizontal space and if you are a filer, have lots of vertical space. Terah Kathryn Collins, founder of the Western School of Feng Shui, points out that having a Feng-Shui-friendly space is not about being immaculate, it is about having a space that doesn’t irritate, confuse, or overwhelm you. Spruill and Watson also add that you should have appropriate lighting, an ergonomically comfortable chair, and a window or picture that provides you with a depth of view that you can turn to exercise your eyes regularly. When positioning your desk, you should not have your back to the door. If there is no way to avoid this, add a mirror so you can see the entrance. 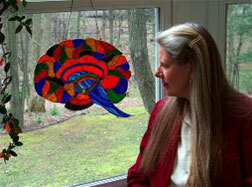 She encourages writers to set up their room first, personalizing the space with art, photographs. and objects that are meaningful and inspire creativity. Then step back and examine the Feng Shui of the space. Does it flow? Does it have too much or too little of an element? Does anything need to be moved? At this point, you can even use a bagua map to help focus attention on the areas that correspond with your goals in life (self/career, wisdom/knowledge, future/fame...). The room is divided into eight sections. The bagua is a template that can help you determine where those areas are in your writing room and how to enhance each one with a variety of objects, colors, and scents. You will also want to keep in mind the Yin/Yang energy in your writing space. The concept of Yin/Yang, or opposites, is an important aspect of Feng Shui: light/dark, male/female, loud/soft. Together, these complimentary forces make a whole and one cannot exist without the other. Spruill and Watson describe Yin energy as dark, quiet, still and small, and Yang energy as light, with sound, active and big. When you have a good balance between both of these, the environment will feel comfortable and harmonious. Drawing on Aromatherapy and the sense of smell when we write can be a powerful tool. Spruill and Watson recommend using Rosemary for recall and memory, and Jasmine or any citrus for alertness and productivity. Keep in mind that aromatherapy use depends on culture and background of the person. Have a vase full of yellow and some bright orange flowers. The orange can help with connectivity to new plots while the yellow, based on intensity, can promote investigation. The brighter the yellow, the more clarity it brings. Include a water element like fountain or flowing water sound effects, (very lightly in background), as wood, the creator cannot survive without water for nourishment. Electronics that use a sudden boost of energy to run (printer, fax machine, copier) can be draining to us. Don’t have this type of equipment too close to your creative workspace. 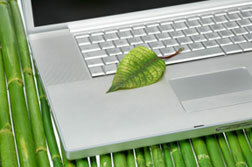 Plants can be used to minimize the effects of the electromagnetic fields. Hang a wooden chime in your window. The movement activates stagnant chi and stimulates your money-making potential. Wood is the symbol of growth. Electronics like your computer generate electromagnetic fields that can reach as far as thirty inches. Once again, you can use plants to minimize the effects. Boost the south wall of your office for fame and recognition. Place articles sold, awards you have won, diplomas, pictures or letters from famous people on your south wall. 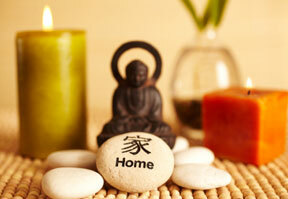 The five elements, fire, water, wood, earth, and metal, give us the tangible aspects of Feng Shui. Each is unique and has specific colors, textures, shapes, and objects associated with it that bring out the essence of each one. Fire and water are seen as catalysts. Wood, earth, and metal are content elements. Although each is used for a different purpose, it is important to remember that how these elements are combined and interact with each other is what makes a space feel welcoming or forbidding. The Tao, an Eastern philosophy, states that everything is connected, and in order to be happy, we must live in harmony with nature, our surroundings, and the people around us. By making adjustments to our physical environment, we can get rid of unnecessary obstacles in our way and clear our pathway toward writing success and happiness. Kerrie Flanagan is the Director of Northern Colorado Writers (NCW) and a freelance writer with over 125 articles published in national and regional publications. The 6th annual NWC conference is March 25-26, 2011 in Fort Collins, Colorado.